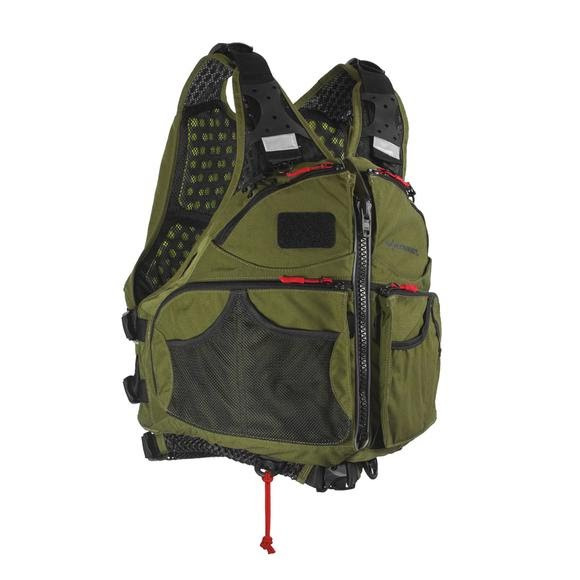 Serious fishing calls for a serious PFD, one with the AirComfort System™ to support hours in your boat and the proven performance of Cordura® fabric for when the big one bites: Extrasport's Eon Angler fits the bill! Serious fishing calls for a serious PFD, one with the AirComfort System™ to support hours in your boat and the proven performance of Cordura® fabric for when the big one bites: Extrasport &apos;s Eon Angler fits the bill! Extrasport&apos;s AirComfort System™ looks dramatically different and provides ultimate fit and comfort. Ariaprene™ (perforated neoprene) straps, wrapped in mesh, lightly pad the shoulder strap area without restricting air flow through the straps. Inside the PFD, channeled pads of EVA bump foam minimize skin contact to promote air circulation. In the EVA bump foam pads, the spacing between bumps promote air flow, dissipate moisture, minimize surface contact with skin, and is covered with comfort mesh. The air channels in between pads create natural paths for air circulation.Â The chimney shaped mesh vent drafts air through the back panel. For the floatation, layers of skived (cut on angle) PE foam provide maximum freedom of movement and prevent chaffing. The thin layers of shaped foam contour to the body for great fit and maximum mobility. The contouring is visible in the shape of the PFD. Measurements S/M: 40" - 46", L/XL: 48" - 54", 2XL/3XL: 54" - 60"